I am extremely jealous of) was being in the meatpacking district of New York at the Standard Hotel, when Gossip Girl was being filmed. He claimed that it was just 'crazy.' "There were about 15 enormous trailers all lined up, (one for each star) and before the scene is filmed, they have stand ins to get the camera angles right. The Stars then walk into the shot accompanied by lots of security guards. I was just sitting on a couch and I looked up and Edward Westwick (Chuck Bass) was sitting near me. Then I looked along and there was Blake Lively (Serena), Taylor Momson (Jenny) and Leighton Meester (Blair)!" 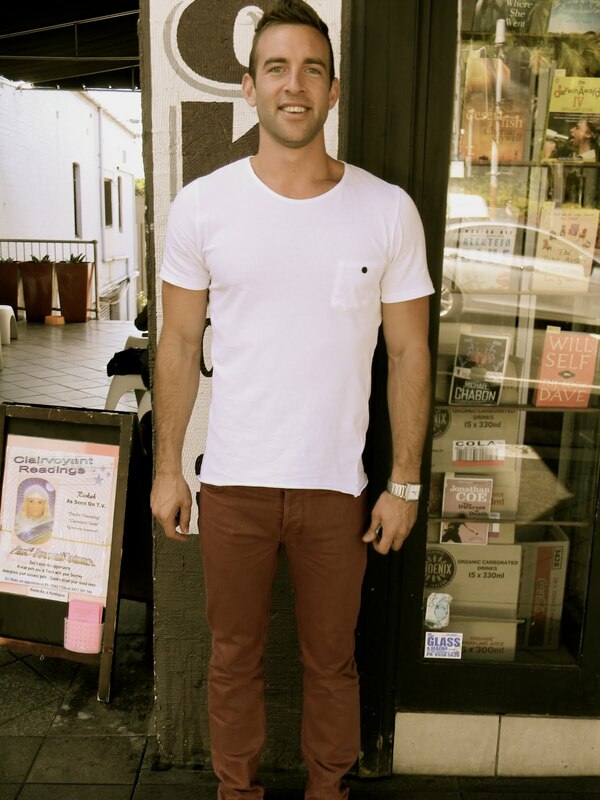 Luke is just a down to earth, northern beaches boy, who holds great talent and an fine eye for men's fashion. If you haven't already, vote for Luke Scott to win CLEO's 2011 Bachelor of the Year; as I feel that a laid back, 'real' guy, who is doing all he can to chase his dreams in life deserves to win. One motto he lives by is; 'Life's too short to do something you don't want to do, or be something you don't want to be." and I couldn't agree more! How long have you been a fashion designer for? "I landed my first job at Sportscraft around August 2005, so about 6 years." "I actually went to FBI Fashion college and did the business course. From there I undertook work placement at Sportscraft and they offered me a job after a few months or so into my work placement. At first I didn't know weather to except the job or not, as I still wanted to continue studying, however they let me work 4 days a week there, so I could still study." then a month later, all the guys are wearing them. (Laughs) I try to think from that angle too." Would you be interested in designing for womenswear? more inspiring to design for." What are the up and coming trends in Menswear? "It's becoming a lot more dressy. Its all about unvarnished tailoring- like jeans put together with shirts and nice jackets. There is a big move away from tees." Is Australia always where you want to be based? "I mean I love Australia for the lifestyle. I am from the Northern Beaches and I love it there, but I would love to go to New York. When you are there it is just the best vibe; it just pumps you up. There is so much happening in such a small area. I love it." Career-wise, where do you see yourself in 5 years time? "I would love to combine the TV side with the fashion. I hope fashion TV really picks up in Australia. I would love to do fashion TV presenting." "I'm a jeans and a tee type of guy. I don't try to hard. I love Winter as you can chuck on a nice jacket." "Those bin-tang singlets from Thailand, you see groups of guys wearing after holidaying there and I hate them. Also Bright suits and of course crocs!!!!!" Best fabric to work with? "At Saba there was a suit made with wool and a silk blend, which adds a nice, light shine finish." Highlight of career so far? "The continuous travel that I get to do." Do you have any desire to start your own label, or will you just continue designing for companies? so busy with other projects." Do you feel that menswear is looking forward or looking back and recreating? "It is a combination of both really. There is the modern slim silhouettes that are in, along with the simplistic modernism. Graphics have definitely died out. Younger guys these days are really leading the way these days." If you had to choose another career, what would it of been? "Definitely Television. My mum is an actress (Helen Scott from A Country Practice) So I grew up around all that." Other than design where else do you use your creativity? (Pause) "That's hard. I think it just really influences my life's everyday things." "James Dean definitely. Also, Jake gyllenhaal; who either has good style or a good stylist (laughs)"
"Hanging out at the beach and exercising"
"The brand J.Lindeberg who only does menswear and I like ACNE." How did freshwater blue come about? "My best friend is the main girl in the show. The show started out with her and a group of guys going on schoolies. I went out with them on New Years Eve and the producers asked me to be on it." Have you watched the series, if so whats it like to see yourself on TV? "Yeah, we all have watched it. It's a bit surreal watching myself. Its weird picking up the mannerisms; like the words you repeat over and over." Who is the most inspiring person you have met? "To be honest, it would have to be another of the CLEO guys, Emmanuel from Justice Crew! We got a cab together to Today FM and every word that came out of his mouth was so motivating. I felt so pumped after talking with him! (laughs)"
Speaking of CLEO, what do you look for in an ideal partner? "Someone who looks after themselves; like someone who wants to keep fit, but for themselves not for others. It's best not to be too picky and it can happen when you aren't even looking for it too." Who do you feel is your biggest threat in the competition? "Eamon O'Sullivan and Dan Ewing"
"(Laughs) Yeah I have voted!" How did you get nominated to be a CLEO bachelor? "MTV nominated me. My PR rep called me and asked if I wanted to be in the competition and I said 'yeah why not!'" You have recently finished designing for SABA. What is next? use European fabrics which is something that I am passionate about." What is the latest collaboration with SABA and RUSSH magazine? "Basically the RUSSH editors get to select styles for men's and women's clothing and accessories from SABA. These pieces with each have there own swing tag saying 'Russhh loves.' You can also now buy the magazine from SABA stores." The best things you have ever been told? "'Lifes too short to do something you don't want to do or be something you don't want to be. 'Never stay in your comfort zone for too long' and 'be careful who's advice it is that you take.'"